Are you planning to take a cockatiel as your pet or have you just brought cockatiel home and added this beautiful bird to your family? Being a social, lovable, and intelligent bird, the cockatiel is perfect to be taken home as a pet or even as your friend. 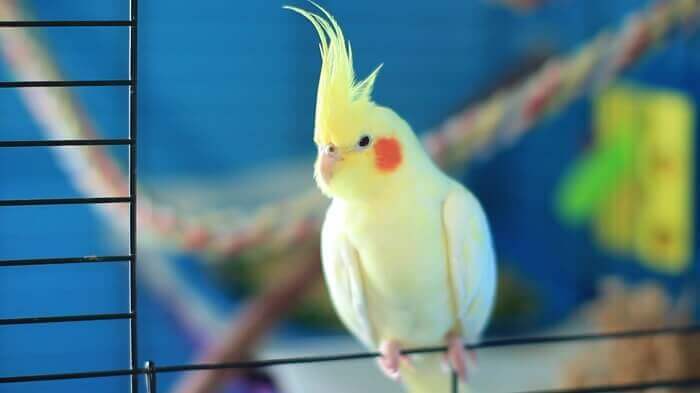 However, if this is your first experience in taking care of cockatiels, then you should know the basic steps to pet cockatiel bird for beginners at home as below. You cannot just decide to bring home a pet without questioning whether you can really take care of it or not. You need to consider the consequences of petting a bird. This includes how to take care of the bird, how much money you will spend on it, how long you are prepared to pet that bird, what food he needs and whether you can afford it or not, whether you are sensitive of them or the noise he makes or not, and how much time you can spend for the bird. These questions are simple yet you should really take them into deep consideration before deciding whether cockatiel is the perfect pet for you or not. Moreover, the cockatiel is a type of pet that needs regular care and attention and have a long life span. You need to spend much time to accompany this bird so he will not feel lonely or abandoned. Besides, taking care of a bird properly can be pricey. You should consider the perfect, simple housing for him, the healthy and balanced diet for their food, plenty of toys to keep him entertained and happy, and other properties and facilities he needs. You also have to make sure that you have enough budget to take him to a vet when he shows signs of sicknesses of when it is time for him to have his annual examination to keep him healthy. Not to forget, cockatiels can be noisy or even can create a little or even big mess. Therefore, you need to consider this carefully; whether you can endure the noises and messes he makes every single time or not. In addition, considering how long you will dedicate yourself to taking care of him is important since he can live up to twenty years. You cannot bring cockatiel home with an intention to take care of him for a short period only. Once you decide to pet a cockatiel, the first step you need to do is purchasing or making a cage on your own. Since a cockatiel is an active pet, you need to prepare a large cage, a minimum of two feet tall, 20 inches width, and 18 inches depth. If possible, the larger the cage the better it is for your cockatiel. In addition, the cage should have vertical bars which are less than ¾-inch apart as well as horizontal bars to allow your cockatiel to climb around. You also make sure that the cage is strong enough, stainless-steel cage is recommended, and free from zinc and lead as they can be poisonous for your cockatiel. To make your cockatiel live comfortably in their cage, you also have to put some perches in it. Most of the time, cockatiels love to use their feet for climbing, playing, and even sleeping. Therefore, the existence of strong perches in their cage is essential for him. It is better to have varied perches in the cage and you will notice that he tends to choose a certain favorite perch for their home where he sleeps and relaxes. Besides preparing the housing, you also have to prepare other supplies such as food bowls, water bowls, a skirt for the cage, cleaning supplies like poop remover and handled vacuum, and a bunch of toys. These supplies may seem trivial but they play important roles to make your cockatiels happy and well-taken care. It is recommended that you always prepare extra supplies so you do not have to worry when you are running out of supplies at midnight or during an unwanted situation. One of the steps to pet cockatiel bird for beginners at home is taming your cockatiel. It is an important step unless your cockatiel is already tame when you buy it. The major thing to get your cockatiel tamed is to get him used to your presence. It is important not to seclude your cockatiel when you just brought him home. Place your bird in the most common area in your house where there are a lot of human activities so the cockatiel is used to seeing human around. Besides, you should also spare some time sitting and hanging around the cage. You can talk or whistle to it so he can recognize your voice and presence. If he already gets used to your presence and starts approaching you, offer him some small treats. After getting your cockatiel used to your presence for about a week, you can start to move on the next taming step: getting him close to you. You can start this step by opening the cage door and prompting him to come out with a treat. Afterward, place some food in your palm and have the cockatiel eat it. Taming your cockatiel is not enough. The next step you need to do is training him. Once your cockatiel is willing to eat in your hand, you should make them step into your hand. Please note that you should do this slowly; never force them to step up. To do this, you can start by pressure his abdomen above his legs slightly using your finger. By doing this, he will immediately step up. Don’t forget to give him a treat and praise him every time he does this. Next time, you can say “step up” when you apply the pressure so he will eventually associate with the word with the action of stepping up. Those four steps are the basic or the first steps you need do when you decide to make cockatiel your pet. After completing the steps to pet cockatiel bird for beginners at home above, the next thing to do is learning how to take care of your first cockatiel.